I did something on this challenge that I don't do very well - paper piecing. 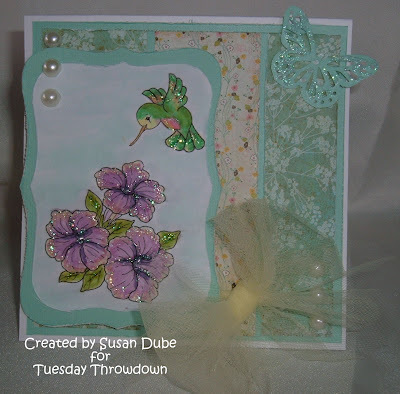 Today over at Tuesday Throwdown, we are being sponsored by Fred, She Said Stamps and I chose their gorgeous image, Hummingbird and Petunias. I love how unique hummingbirds are in their flight patterns. If you can think of a diection, a hummingbird can fly it! When I was living in Ohio, Mom had some hummingbirds that nested in the tree in the front yard and they would come to the front window and eat from the feeder. Their colors were so clear and vibrant. I loved sitting there watching them feet and the flit away. Talk about relaxing! I colored he image with coics and paper pieced the leaves with some solid yellow/green paper. I added stickles to the flowers and bird and used my nestabilities to cut out the image and border. The tulle is from Joann Fabrics and the pearls from Studio 112. The papers are some of my hording from BasicGrey. I love the look of this from the sides. 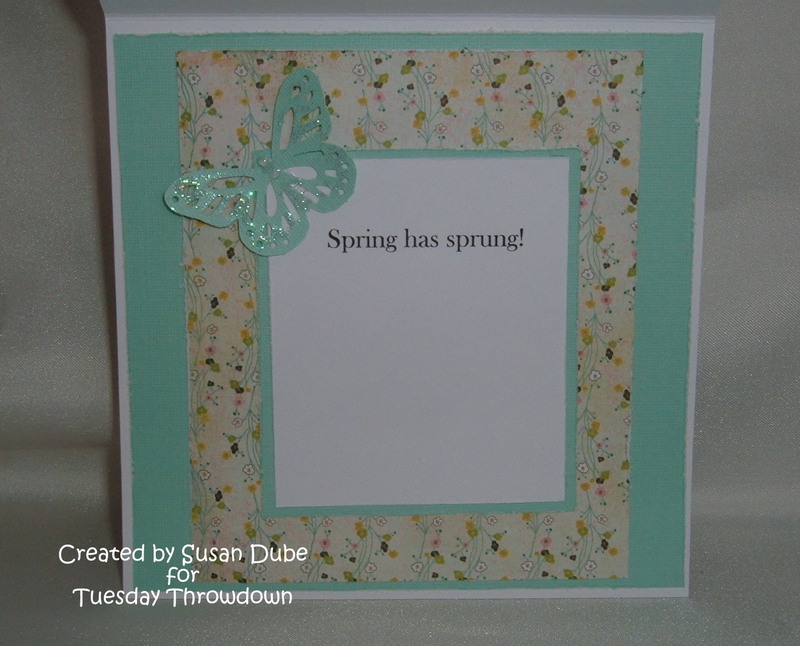 I want to try and use more sentiments on my cards and this image reminds me so much of the hope of spring and deided to add it and another butterfly to the inside. 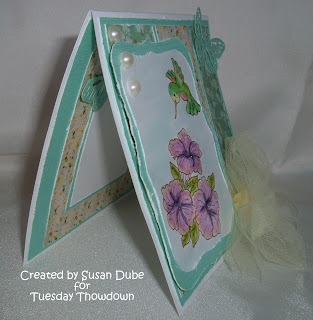 All the details for the challenge are listed on our Tuesday Throwdown Challenge Blog. 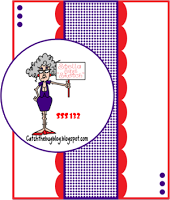 Come on over and take a look at the fabulous talent we have over there and show us your paper piecing! Beautiful!! I love the colors and the image is so lovely too. Nice sparkly details! Love the butterfly! Thanks for joining us in the Hobbycutz challenge! Delightful card, love the sparkle. Thanks for joining us for our first challenge. This is so sweet Susan with wonderful coloring, and fantastic take on the sketch. Love the extra sparkle. 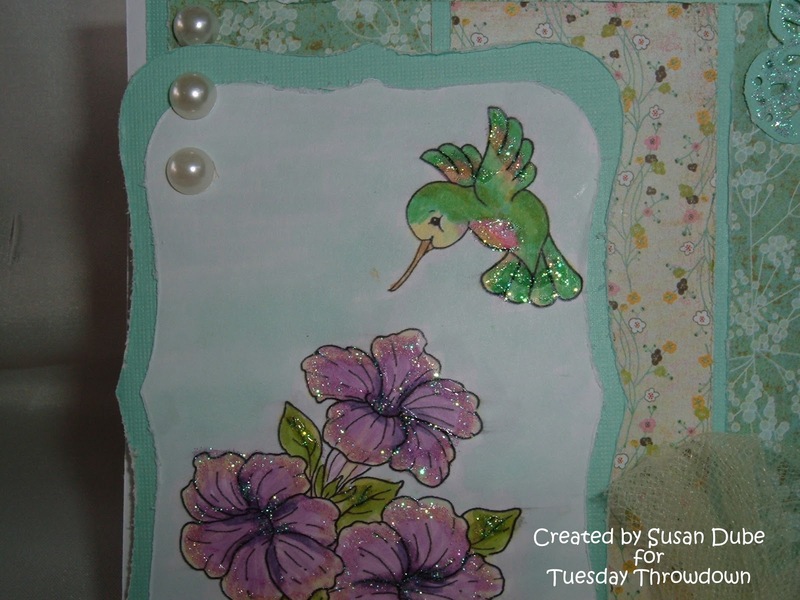 "Hugs"
Susan great job on your card I love hummingbirds. Thank you for playing along this week at OSAAT. I sure hope to see you back again very soon. Good Luck in the challenge!!! OOOhh love the colours.. So pretty! That little humming bird is so cute. makes me think of my grandmother who always loved them. What a gorgeous card! The hummingbird is beautiful... and the bow adds the perfect touch! 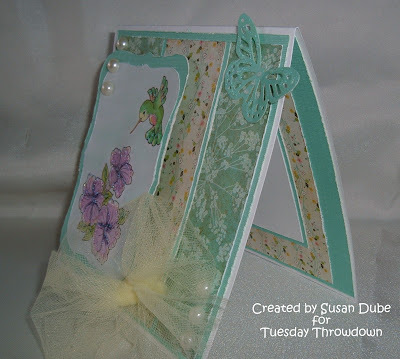 Thanks for joining us this month at Great Impressions Stamps! 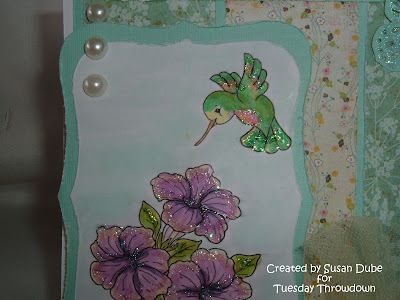 What a gorgeous springtime card and I think hummingbirds are lovely to watch - if you can catch them fast enough to see! Nice way to capture a memory and it's so pretty. 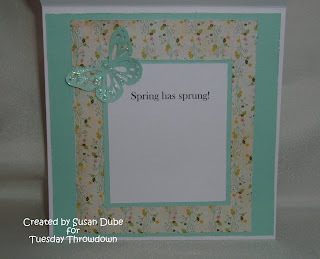 Love the colors you've selected, perfect to include with our Opus Gluei spring has sprung theme and thank you for sharing with us! Sorry I took so long to comment, have had a computer with a serious case of spring fever!